Nestled between the Great Wolf Lodge and Kohl's, this park is a hidden gem along US-31. 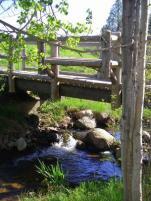 The 3/4 mile trail network includes wooden bridges and boardwalks following Kids Creek. Development of this park into a passive recreation resource is an ongoing process. Kids Creek Park makes for a great walk after some shopping at the nearby businesses! 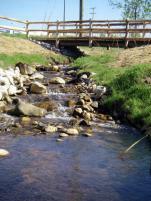 Dedicated to Garfield Township during the development of the Great Wolf Lodge, this 20-acre park has seen extensive volunteer effort to restore the stream banks of Kids Creek, which meanders though the park. The stream banks had been damaged by decades of buffalo traffic (the former buffalo herd was once the largest east of the Mississippi River), but volunteer efforts have made an incredible difference to the stream's health, and ultimately, West Bay's health by reducing sedimentation and increasing shade and habitat for fish and insects. 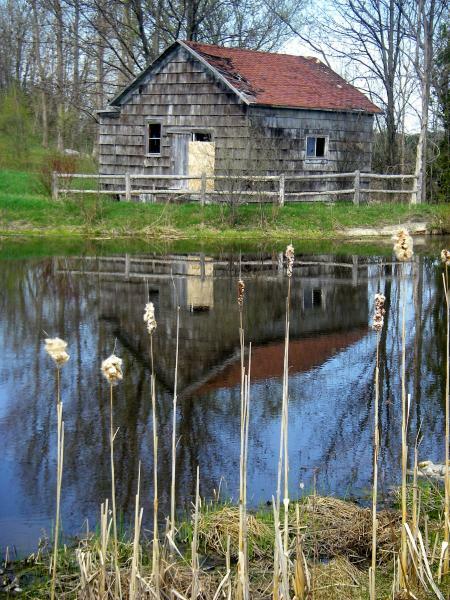 Click here to read more about restoration efforts at Kid's Creek. In the summer of 2009, a 300-foot portion of Kids Creek was re-routed around a drop-culvert, an obstacle that was limiting the upstream migration of fish. An entirely new streambed was created, and the stream now looks like it was always there! While the construction crews were there, they also dredged out the old Oleson fish pond, which had become filled with sediment. Additionally, a new bridge was built to connect the park directly to the bike path on the west side of US-31, and a new trailway was built with the help of Great Wolf Lodge volunteers. To date, over 30 specific erosion sites have been rehabilitated within the park. Many thanks to Al Strange and the Grand Traverse County Jail Crew, the Watershed Center Grand Traverse Bay, the Grand Traverse Conservation District, and other local environmental action groups for their significant efforts in making this park a beautiful place for all to enjoy and for helping to increase our water quality. Kids Creek Park is accessed via the parking lot between Kohl's and Bed Bath & Beyond (look for the "Exit" sign), or from the non-motorized trailhead along the US-31 bike path, which is a great spot to pull off from the path, park your bike, and take a walk around the stream! Public restrooms at the site are not available. 2016-Update-Buffalo Ridge Trail- Phase II is located in Garfield Township, and consists of a non-motorized multi-use trail project approximately 1 mile in length connecting Traverse City West Middle School to the new YMCA at Silver Lake Road and providing connectivity to Kid’s Creek Park. The trail shall be a paved surface designed to AASHTO and ADA guidelines. It will have multiple connections with the roadway system, as well as a connection with existing trails at West Middle School and a new connection to Kid’s Creek Park. Construction of this project will be funded in part by a Michigan Department of Natural Resources Trust Fund (DNRTF) grant. Look for completion of this trail summer of 2016. This page last updated on 3/2/2016.